Bloggers and business owners already do so much from content creation to budgeting and bookkeeping to social media and networking. The list continues to grow. Do you have the capacity to oversee a healthy and sustainable Pinterest strategy too? If not, it might be time to hire a Pinterest Strategist. Pinterest VA’s have their place; however, if you want to do less work and be hands-off, then you need a Pinterest Strategist. Pinterest VA’s are going to depend on you to guide the strategy and tell them when and how to do things. While there might be people who can actually do things without asking for permission, many Pinterest VA’s are looking at you as the business owner to guide them on the pinning strategy. This need for guidance can actually create more work on your part. You will need to constantly remind them of when old content should go up and what boards, which tribes, and all those rules. Think about if you have the time and capacity to oversee the strategy associated with hiring a Pinterest VA.
Decision fatigue is real when it comes to being a business owner. Adding a Pinterest strategy into the mix can really overwhelm you, especially if Pinterest isn’t your thing. In order to really be hands-off and not worry about anything related to Pinterest, you will want to hire a Pinterest Strategist. Let me tell you, there is nothing wrong with hiring out pieces of your business that you are not the expert at. For instance, I hire a CPA to manage my taxes because that is not my zone of genius. Let’s dive a bit more into decision fatigue. According to the Wall Street Journal, 35,000 decisions are made by the American adult in one day. Yall, that is insane. What’s even crazier is that those decisions can wear your mental energy down throughout the day due to the time and energy it takes to make those decisions. Instead of constantly being worn out from making decisions all day, you can 1) make fewer decisions and 2) delegate those decisions to someone else. Hiring a Pinterest Strategist takes care of those two things for you! Not only does having someone oversee your Pinterest strategy and management eliminate a plethora of decisions, but it also delegates all decisions related to Pinterest to someone else. Ahhhhh. Can you feel the tension melt away? While you’re focusing on creating new content, launching that new course, or finalizing a brand deal, someone else is handling all the Pinterest-related things for you. That is called working smarter, my friend. In order to get Pinterest truly off your plate, where you don’t even have to think about it, you want to hire a Pinterest Strategist. These experts are not only getting your content on Pinterest and in Tailwind Tribes, but they are doing everything in a strategic way that they have developed over time. Pinterest Strategists have a tried and true method when it comes to Pinterest as a marketing tool. These experts even take your history and goals into account when using their strategy with your account. Pinterest Strategists not only schedule pins, but they also create the strategy for your Pinterest based on your pinning habits and your business as well as your niche and ideal target market. That’s a huge piece to not have to worry about. Being strategic with Pinterest as a marketing tool can really improve your SEO, your traffic to your website, and, in turn, increase your sales. As a Pinterest Strategist, my goal is to increase your website traffic. Once they are on your website, it is in your hands to get them to commit. Whether you want them to join your email list through a free opt-in or purchase a product from your site, you control that piece. Pinterest Strategists are experts at growing the traffic. What could more website traffic mean for your business? 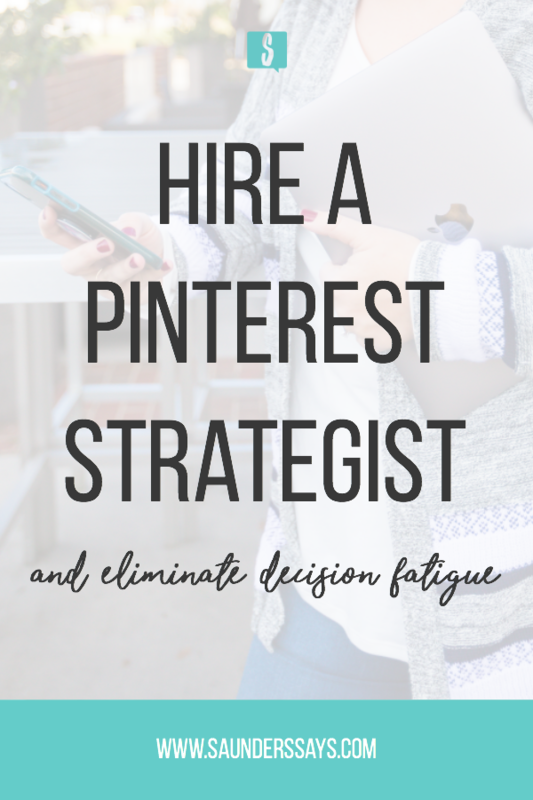 Are You Ready to Eliminate Decision Fatigue and Hire a Pinterest Strategist? 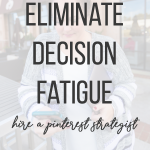 If you’re ready to eliminate decision fatigue related to Pinterest, I have a little gift for you! Get my free Pinterest Strategist Interview Questions document to use during your next hiring interview. This will help you hire the best fit for you! I just started using Tailwind and have noticed such a difference in my Pinterest traffic so far. I have to try your advice, too! This is a great idea and something I will consider for my blog at some point as I’m growing. Thanks for the tips! Tailwind has been a game changer for me! Tailwind is great for sure, but having someone managing your strategy is even better! You’re so welcome! Thanks for stopping by, Angie!